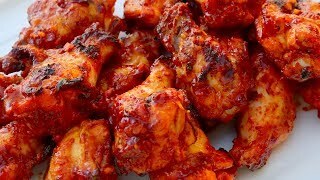 Today’s recipe is hot and spicy and great for summertime; it’s Korean-style spicy BBQ chicken. It will be welcome at any family barbecue or get-together with your friends. I made it with chicken drumettes but you could use any chicken for this, as long as the pieces are small and can absorb the spicy sauce well. You could try chicken drumsticks or chicken breast but you will have to slice and score them nicely so they will marinate well. Use grill or thick grill pan to cook it but be sure to cook outside the home because it gets really smoky and spicy as it cooks. Don’t panic if you have trouble breathing from the spicy fumes! The finished dish it not as spicy as you might think, and if you like it milder, you can use less hot pepper paste or flakes. The cooking time will vary depending on the heat of your grill and the size of your chicken pieces. You can try the chopstick test to see if it’s cooked: spear the chicken with a wooden chopstick, and if it comes out clean, it’s ready! When I filmed this video, I made this for my family dinner while I was traveling in the California desert. I served it with rice, kimchi, cold cucumber soup, and acorn jelly salad. It was very refreshing and simple dinner and everybody enjoyed it. The cold cucumber soup and seasoned acorn jelly really go well with the spiciness of the chicken. Enjoy the recipe and happy cooking! Put the chicken in a bowl, add milk and mix it together by hand. Combine garlic, ginger, green onion, hot pepper paste, rice syrup, hot pepper flakes, sesame oil, and black pepper in a bowl and mix it well with a spoon. Strain the chicken and squeeze a little to remove any excess milk. Put it in a large bowl. Add the paste and mix it well by hand. Refrigerate for 10 to 30 minutes. Grill or BBQ the chicken on medium heat for 30 minutes, or until well cooked. Keep flipping the drumettes over with your tongs so they don’t burn on the grill. Brush on any remaining hot sauce after the first turn over. Posted on Saturday, August 5th, 2017 at 9:54 pm. Posted September 22nd, 2018 at 5:29 pm | Log in to reply. Can this marinate overnight? Or will it be too spicy? Thank you! Posted March 5th, 2018 at 2:47 pm | Log in to reply. I absolutely love this marinade and this flavour! Is this used for anything else in Korean cuisine like pork, beef, fish etc? I want to explore how it can be used! Posted September 19th, 2017 at 9:58 pm | Log in to reply. My husband was so surprised when I fixed the Spicy Korean Chiken. He thought we were having plain old BBQ chicken. We both loved the flavor and juiciness!!!! Posted September 22nd, 2017 at 9:28 am | Log in to reply. It looks amazing! I can almost smell the smoky yummy chicken! Congratulations! Posted August 13th, 2017 at 10:51 pm | Log in to reply. Posted August 11th, 2017 at 12:11 am | Log in to reply. Posted August 10th, 2017 at 10:54 pm | Log in to reply. This is the most amazing BBQ recipe I’ve tried in a long time! I made a double batch, served it with leftover Japchae, my daughter prepared tteokbokki and had spicy kimchi on hand. Yes.. we used your recipes for Japchae and tteokbokki, also amazing! Thank you for sharing your talents with us! Posted August 8th, 2017 at 12:34 pm | Log in to reply. I made this last night using chicken thighs I had on hand. I soaked the chicken in buttermilk for a few hours instead of regular milk cause that’s what I had on hand. anyhow. I marinated the chicken for 4 hours in the sauce. it turned out very juicy and a little tangy from the buttermilk. it was a hit! remember to grill on medium low, and watch it! mine got a little charry on medium. Posted August 8th, 2017 at 1:36 pm | Log in to reply. omg! yummy yummy! It looks so juicy and I can almost taste it! Posted August 6th, 2017 at 4:49 pm | Log in to reply. Hi Maangchi! Love your sunglasses in the video! And the chicken looks delicious: sweet, sticky and spicy! Can’t wait to try this! Posted August 8th, 2017 at 1:41 pm | Log in to reply. Posted August 6th, 2017 at 10:07 am | Log in to reply. This sounds delicious, but I have to ask; how long will gochujang last in the refrigerator, Maangchi-ssi? Mine has been in there for some time and I’m worried it will go bad before I use it all! Help? Posted August 23rd, 2017 at 1:08 am | Log in to reply. Gochujang will last FOREVER in the refrigerator, as long as you don’t contaminate the container whenever scooping some out to use in recipes or as a dip. Use a clean spoon and you should be just fine. It’s still usable after the “expiration” date as well. Like I said, it doesn’t go bad; it’s a fermented paste. Posted August 5th, 2017 at 11:39 pm | Log in to reply. Maangchi: “My legs are on fire!! !” Lol. Of course they are! And the BBQ chicken looks great, too! 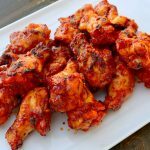 This recipe was originally posted on August 5, 2017 at 9:54 pm by Maangchi. The video was watched 750,222 times on YouTube & has 18,627 likes!